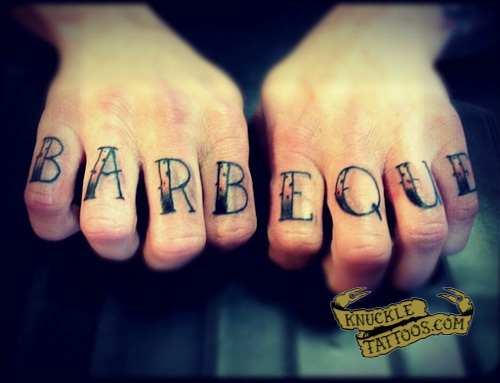 Here’s a pic of my BARBEQUE knuckles. They were done by Rick Meggison at Marked4life. I started cooking BBQ about 7 years ago. About 3 or 4 years ago I decided BBQ was what I wanted to do for the rest of my life. I started practicing more, writing recipes and created my own brand and logo. Check out my website SBQue.com and you can also follow me on twitter @SBbarbeQue (shameless plug, I know). I have recently taken some more steps towards making my BBQ my living. Rick is my friend and a member of our cooking team @TattoosNQue (I know, another shameless plug). We were hanging out the night before Zombie Jesus day or most commonly known as Easter. I had planned on getting this tattoo a little bit down the road. He convinced me to get it by using the zombie jesus metaphor and calling it my BBQ resurrection…and here we are!